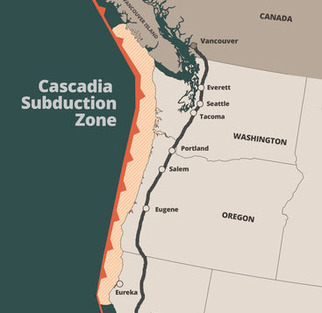 Local seismologists and geologists say the 7.0 magnitude earthquake that hit Alaska should make people in the Pacific Northwest realize how disastrous the threat of the Big One is for our region. A good posting and many of you have probably heard a 9.5 has been foretasted to occur in this area with accompanying Tidal wave as a result of the quake. Your comment got my attention. I would hope the latest 7.0 would make the region take notice and hopefully cause some to repent. I know many of you that live there or in that vicinity are interceding and God Bless you for that. I know you are under His watchful eye. The name Cascadia means “cascade, waterfall” – it has double meaning. As I looked at a seismographic photo of Washington it became clear to me. The Earthquake followed by an tsunami related wave could easily take out the “strong arm” piece of land on the NW side of the state. This cascade of Judgement is how God will awaken people to His Power and authority. The means He will use to bring restoration to depravity. When The Big One occurs, know that a cascading waterfall of Mercy will fall over and upon those within The Lord’s Will. I believe this may be the beginning of The Wave Sheaf, First Fruits Harvest… when the first signs of The Outpouring manifest. What I mean is that the Judgements will most likely occur simultaneously in more than one location across the US… affecting those cities that The Father has deemed it’s skyscrapers have become as “idols” and therefore an abomination to Him.